H. Rick Bamman - hbamman@shawmedia.com Vernon Hills fans celebrate a first half touchdown against Peoria in the Class 5A State Football final Saturday, Nov. 26, 2016. Vernon Hills placed second with the 62-48 loss. 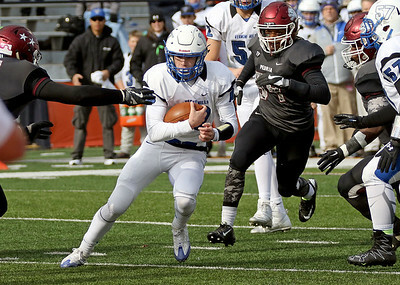 H. Rick Bamman - hbamman@shawmedia.com Vernon Hills quarterback Kyle Hull tries to elude Peoria defenders Eli Horton (left) and Bolo Carruthers in the second quarter during the Class 5A State Football final Saturday, Nov. 26, 2016. Vernon Hills lost, 62-48. 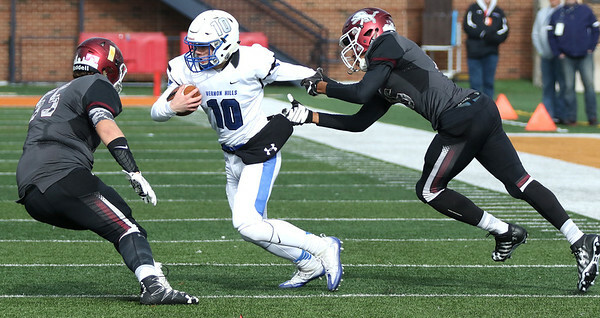 H. Rick Bamman - hbamman@shawmedia.com Vernon Hills quarterback Kyle Hull finds a hole in the Peoria defensive line on his way to a touchdown in the first half during the Class 5A State Football final Saturday, Nov. 26, 2016. 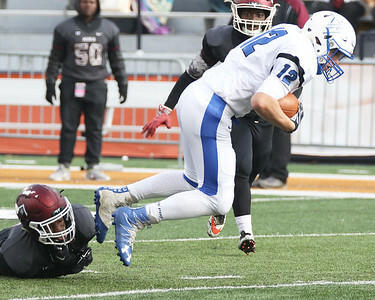 H. Rick Bamman - hbamman@shawmedia.com Vernon Hills Derek Jarrell is tripped up by a Peoria defender in the second quarter during the Class 5A State Football final Saturday, Nov. 26, 2016. 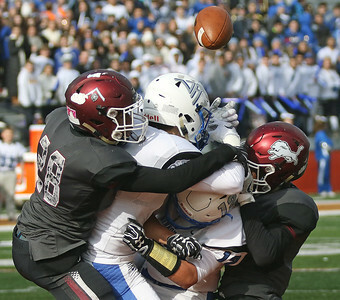 H. Rick Bamman - hbamman@shawmedia.com Vernon Hills receivers Chris Mariella (left) and Derek Jarrell are sandwhiched between Peoria defenders Orlando Moore (left) and Jazzton Logan in the first half during the Class 5A State Football final Saturday, Nov. 26, 2016. Mariella was shaken up on the play. Vernon Hills placed second with a 62-48 loss. 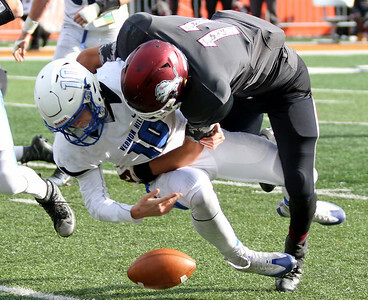 H. Rick Bamman - hbamman@shawmedia.com Vernon Hills's quarterback Kyle Hull looses the ball as Peoria's Colton Smith-Brown makes the hit in the fourth quarter in the Class 5A State Football final Saturday, Nov. 26, 2016. Peoria won, 62-48. H. Rick Bamman - hbamman@shawmedia.com Vernon Hills head coach Bill Bellecomo and Andrew Smith head to the award presentation after their second place finish in the Class 5A State Football final Saturday, Nov. 26, 2016. Vernon Hills lost to Peoria 62-48. 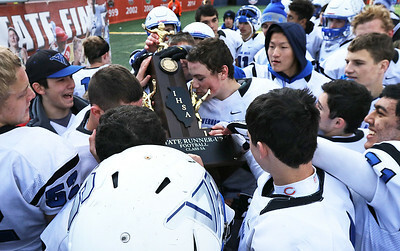 H. Rick Bamman - hbamman@shawmedia.com Vernon Hills players swarm around the second place trophy after the Class 5A State Football final Saturday, Nov. 26, 2016. Peoria won 62-48. 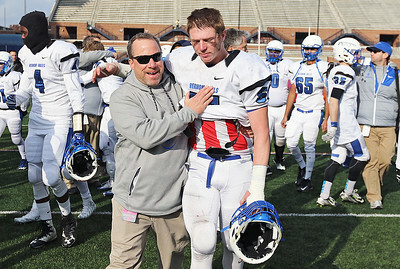 Vernon Hills head coach Bill Bellecomo and Andrew Smith head to the award presentation after their second place finish in the Class 5A State Football final Saturday, Nov. 26, 2016. Vernon Hills lost to Peoria 62-48.